The first PhD from the Chobotix group was successfully defended today. Many congratulations Jitka! Several new students joined the Chobotix team recently. A very warm welcome to Anna, Zuzka, Martin J., Jan K., Marek Š., and Michal. Good luck with your work! Congratulations to Marek Schöngut and Pavel Kovačík who successfully defended their diploma projects and passed the state examinations today, completing this year’s cohort of chemical engineering graduates from our lab. Today, Viola Tokárová and Ondřej Kašpar successfully defended their Diploma theses and passed the state examinations, thus officially graduating with a master’s degree in Chemical Engineers. Many congratulations to both of them! 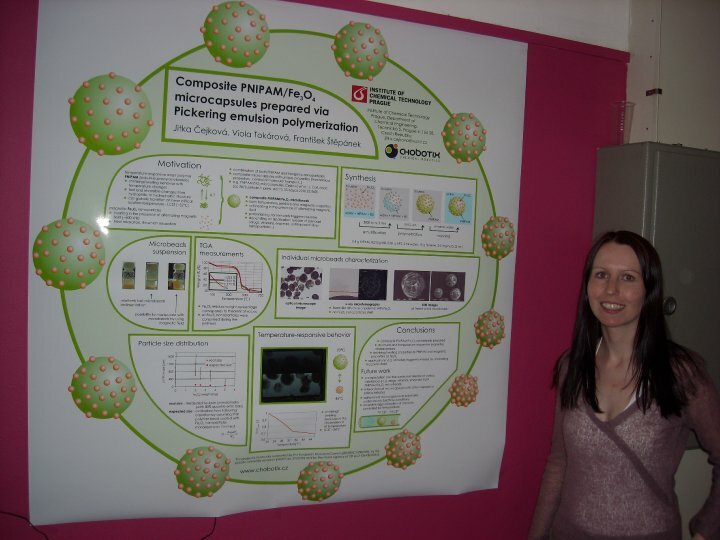 Very many congratulations to Jitka Čejková for winning the Best Poster Award at the Student Conference of the 6th World Congress on Particle Technology. Honza Zíka has successfully represented the Chobotix project at this year’s Campus Party Europe in Madrid. He gave a presentation and even met the EU Commissioner for research in person! Congratulations to James Kimber who won a poster prize at the PhD research symposium at Imperial College London for his work “Advances in Computational Simulation of Pharmaceutical Tablet Dissolution”. Workshop “My Science” (European Programme for Young Journalists) started in ICT today. Three young journalist will work in our lab! Eva Vlčková (Lidové noviny, Praha), Giorgio Mammoliti (LiberoReporter, Italy) and Elena Vulpe. Welcome to Erasmus student Damien Kervennic from Paris in our lab! The most recent addition to our equipment range has been unveiled today: the Laser Scanning Confocal Microscope Fluoview FV1000+IX81 from Olympus. Today Jitka Cejkova has successfully passed her State Doctoral Examination. Congratulations! František Štěpánek in the Czech daily paper Lidové noviny again.